"Great on Carrot Walnut Cookies (see recipe)." Beat cream cheese, butter or margarine, orange peel, and orange juice until creamy. Beat in confectioner's sugar until blended and smooth. Spread about 1 1/2 teaspoons on each cooled cookie. Sprinkle with walnuts. Let icing set 1 to 2 hours. Refrigerate in an airtight container with waxed paper between layers up to 1 week. 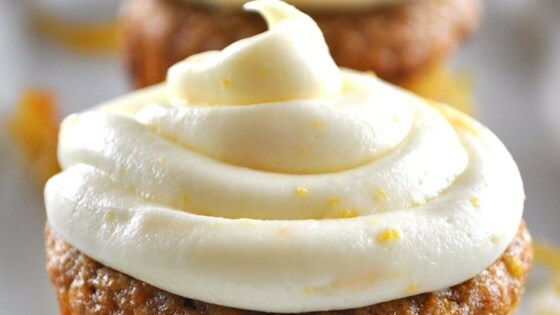 See how to make the best cream-cheese frosting for cakes, cookies, and breads. I give 4 starts to this recipe due to don't need the 2 cups & a half of confectioners sugar only 1 cup & a half, and need 1/4 butter, I cover a layer orange cake. did all but the walnuts and used it on pumpkin ginger muffins.... and a little on a cinamon raisin bagle - both yuuuumy! Very good. Didn't have orange zest so I added some orange marmalade. Everyone loved it. Put it on Carrot Bread from this site.